QUESTION: Don’t we already have plenty of legal vehicles for protecting land, such as National Parks, National Forests, and wilderness areas? Why have another? ANSWER: There are many categories for protecting land, but they share a common limitation. They are primarily aimed at protecting the most interesting features of the land itself, rather than the extended mix of land and settlement that defines a frontier. As a result, in many areas of the West, particularly near the big cities, beautiful and well-conserved mountain lands can be reached only by driving through formerly agricultural valleys that now resemble strip shopping malls. The Bright Angel Frontier would protect not only the most interesting terrain, but also distinctive and interesting types of settlement, such as Nineteenth Century towns and farming valleys. Some familiar statutes, such as the 1964 Wilderness Act, are starting to reach the limits of what they are capable of accomplishing. The limitations of the Wilderness Act are several: (1) it takes roads as a given, and so is limited to conserving the often-small areas within the road grid; (2) it has no provision for worthy non-wilderness uses, such as historic preservation, and so its base of popular support, while large, in unlikely to grow much more; (3) it does not address the interface between wilderness and nearby residents, or attempt to accommodate the needs of local communities, further limiting its potential support; (4) it is a brittle defense, in that, once some small development takes place, there are few barriers to further development; and (5) it has few provisions for acquiring and removing evidence of prior development in more accessible valley bottoms, thus limiting wilderness to areas of fragmented and inaccessible terrain, which are not representative of the landscape as a whole. None of this means that the Act is obsolete. It will be essential in protecting existing wilderness areas, and useful in designating some further areas from time to time. But if land preservation is to have a vibrant future, it will profit from having some new tools to work with. QUESTION: The Bright Angel frontier valley would be as large as a good-sized national park. Isn’t that an unrealistically ambitious goal? ANSWER: The area is certainly very large. Creating it does not involve the sort of tremendous leap that this question supposes, however. In the first place, if we can find a location with few current inconsistent uses there should be relatively little disruption from the project. Moreover, we are speaking of only a single valley. 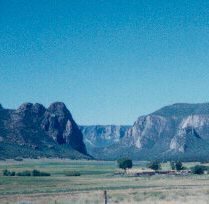 In remote parts of the West there are many suitable valleys. Creating the frontier area will therefore have a high marginal value (since it will be the first entity of its kind), but will not impose high marginal losses on the local communities nearby (since they will continue to have access to other, similar places). QUESTION: Wouldn’t it be impossible to accommodate any substantial number of people in Nineteenth Century conditions without access to modern power for air conditioning, laundries, refrigeration of food, and similar purposes? ANSWER: We forget too readily that people lived without these things until a hundred years ago. Solutions to most of the problems are possible, and one of the appeals of visits to the turn-of-the-century area would lie in re-discovering what these solutions are. Air conditioning can be replaced by shade trees, porches, and awnings. Refrigeration can be replaced by ice boxes, ice deliveries, and smoked meats. Washer/dryers can be replaced by town laundries and clotheslines. Of course, we will make some allowance for modern power in truly essential applications, such as emergency medical facilities. We also need to emphasize that people in the Nineteenth Century area will for the most part be living and visiting in towns. A person on an isolated farm might find the technology of the last century to be wearing and inhospitable. Town life, however, permits enough specialization to provide reasonable levels of comfort and support. A town can offer things like a general store, and someone with a wagon to make home deliveries. QUESTION: Can you really get the water you need for the new towns in the Nineteenth Century area? ANSWER: Surely, from one source or another. It’s important to remember that the population to be served won’t be tremendously large. The entire series of six or so towns would have a total population of approximatly 1200. Even if some of these people are raising irrigated crops, their water needs will still be fairly modest. Those needs can be met through a combination of unclaimed surface water, purchases of water rights from current users, deep-well drilling, and pumping from the Colorado River, depending on the particular location involved. QUESTION: Wouldn’t the proposed new Nineteenth Century towns look very artificial — a lot like Disneyland? ANSWER: The whole world has been artificial, in one sense or another, ever since mankind first tamed fire. Even the most pristine wilderness is artificial in the sense that it is artificially protected from the natural forces of economic development that would otherwise overwhelm it. It is therefore not a particularly useful question to ask whether something is “artificial.” The real question is whether the thing is good. The pre-industrial towns would be good. They are not perfect, since they fall short of the ideal of genuine Nineteenth Century towns that time has passed by. Developed with care, however, and with building codes that permit some individual latitude, they should have many of the qualities of original towns without looking too studied. A number of specific policies might be followed to encourage this kind of internal diversification: some preference might be given to the use of recycled siding and other old materials; some entire old houses, in danger of demolition elsewhere, might be trucked in; and the zoning laws, in a counter-intuitive step, might encourage the use of certain inexpensive and shoddy building materials (like roofing tin) that might have been more common in the past. In fifty years, when the trees have grown and the buildings have mellowed a bit, the towns should look like they have always been there. We should also keep in mind that an important part of the Nineteenth Century area is not just the towns, but also the spaces between the towns — farms, pastures, and wildlands that are far from the modern world but not too far from support facilities. Those spaces would have a pure Nineteenth Century feel as a result of their location and geography, unaffected by the specific character of the towns down the road. QUESTION: While the Bright Angel frontier area is described as a “compromise” proposal, most of its specific features seem to involve matters that are important to the conservation community, such as the nineteenth century towns and the land conservation around them. What’s in this proposal for the free-market development community? ANSWER: The benefits for free-market advocates involve a smaller acreage of land, but the individual acres are more important. The most important benefit will be the new economic activity in the new towns — a small amount of land with significant commerce taking place on it. A second market-oriented benefit will be a significant increase in the private ownership of land. Nevada is currently the state of the Union with the highest percentage of its land in government ownership — 88 percent is owned by either the federal or the state government, and only 12 percent is in private hands. Privatizing even a part of the land in the valley might therefore significantly alter the ratio of public and private lands, and might serve as a way of testing and demonstrating new land-management approaches that involve a combination of privatization with conservation easements that preserve the relevant public values. Another benefit will lie in the economic boost given to existing towns in the region. The gateway towns outside the borders of the historic area should prosper with increased visitation to the region. QUESTION: Will the frontier make sufficient provision for the off-highway vehicle community? ANSWER: The proposed frontier will protect current levels of off-road vehicle use, although it may redirect it, restricting OHV access in some areas while affirmatively supporting it in others. Most fundamentally, the frontier recognizes that members of the OHV community are legitimate users of the public lands, and will ensure a place for them in lands that are just outside the historic valley, but included in the same management package. This might involve creating a new kind of “super OHV routes.” These routes would not be the familiar, utilitarian jeep routes that orginated with ranching or mining purposes, but rather would be designed and funded specifically for recreational purposes. The new routes might therefore run along ledges, or across narrow trestles, or through abandoned mines, or incorporate whatever features the OHV community decides it wishes. Since creating the frontier area itself will have real value for the environmental community, the greens will be asked, in exchange, to support these new OHV facilities. In fact, there is no reason why some special, difficult-to-reach towns could not be built in this area, comparable in some ways to the Nineteenth Century towns of the historic valley. These would be open to internal-combustion engines, and probably to electricity, but would be reachable only by jeep and would be inaccessible to regular cars. In these ways, OHV users will be sure of having continued access to some desirable routes and areas, rather than having all that access at continuing risk of closure, as it is now. QUESTION: Is there then enough benefit in this plan for the conservationist community? Will this meet the needs of groups such as the Sierra Club, the Wilderness Society, or the Southern Utah Wilderness Alliance? ANSWER: The proposed historic valley will offer the conservation community four important benefits, although it will then ask one relatively modest thing of them in return. The benefits are these: (1) local support for conservation of land on the valley floor between and around the towns; (2) some wilderness in the high lands on the valley sides; (3) an intense wilderness at the far end of the valley, where civilization has finally “thinned-out” completely, perhaps to the extent of requiring that the area be left blank on future maps; and (4) conservation of the lands between the new “fewer but better” jeep routes in the adjacent OHV area. In return for these benefits we will ask the green community to support the approach of historic zoning as one legitimate tool in the land-management toolbox, and, in particular, to support creation of this chain of relatively compact, low-impact towns across those lands. QUESTION: How will the frontier connect with commercial routes or broader conservation areas that lie outside its borders? ANSWER: We take no formal position on what should be done with the federal lands outside of the Bright Angel valley, or how those lands should be managed. We do believe, however, that the frontier area itself should be managed so as to mesh effectively with whatever external arrangements are decided upon. Thus, on the development side of the balance, the principal population centers in the area will lie just outside the frontier as gateway communities, and major highways and air routes from those towns will connect the Bright Angel neighborhood with the national transportation network and with other parts of the country. On the conservation side of the balance, the protected land on the sides of the valley will connect contiguously with whatever conserved lands lie outside. This interface might include some “attachment points” that have been deliberately designed to ensure the continuity of particularly important connections such as watercourses or wildlife migration routes. QUESTION: Isn’t the presence of towns (even pre-industrial towns) fundamentally incompatible with wilderness values, and therefore with the goals of the conservation community? ANSWER: There are at least three responses to this question — based on law, on wilderness policy, and on general policy. As a matter of law, the towns would not technically be “in” a wilderness area. They would be in an adjacent Nineteenth Century area, and would therefore not be a precedent diluting the protection available to established wilderness tracts. More affirmatively, the towns would appear to support rather than to undercut a well-considered wilderness policy. It is important to keep in mind that the geographical context of the Bright Angel valley will be significantly different from that of other wilderness areas, and will therefore call for some one-of-a-kind policies. Most wilderness areas are relatively small. They are commonly 5, 10, or 15 miles across, and it is difficult to get more than ten miles from a road. Even the Red Rock Wilderness Act contemplates more such areas, since under that act the wilderness would remain broken up by public roads and prior inconsistent uses. One brochure for the Act notes that no part of the proposed wilderness would be more than seven miles from a road. Tracts of this limited size cannot well accommodate towns, and also have no real need of them, since campers who run into difficulties can generally hike out in an afternoon. The historic valley proposed here would follow different principles, however. Rather than maximizing just scenic values, it will also maximize the value of remoteness. It will be a carless area as much as sixty or seventy miles long as the crow flies, and somewhat further on foot. Rather than being seven miles from one’s car, one can be thirty-five miles. While this is exciting in some respects, it also poses obvious concerns for safety, logistics, and supply. To make this area practical for the majority of wilderness users, it will be necessary to make some provision for places to get groceries and other support. The Nineteenth Century towns seem to be an unobtrusive way to do this. These towns need not spoil the experience of those dedicated backpackers who wish to avoid all contact with civilization, or who wish to avoid it for a particular leg of their trip. Such people can easily pass along the undeveloped land between or around the scattered towns. It is also important to keep in mind that general conservation policy is more than just wilderness policy. (Newspaper writers tend to forget this.) Some provision needs to be made for other uses and other users, including those people who are interested in historic preservation. The Nineteenth Century towns seem like the best means of accommodating those uses without jeopardizing fundamental biological or conservation goals. QUESTION: What should be done about the Utah school trust lands, which are sprinkled in small parcels throughout some of the areas proposed for the frontier valley? ANSWER: There is a simple, outside-the-box solution for this issue: simply forget about it, and walk away. There is a great deal of justice in that course. The federal government will be contributing the great majority of the land to the frontier. This is land that will benefit all Americans in its new use, of course, but it will be of particular benefit to state residents (Utah residents in this particular instance), who live close enough to visit it often, and who will also reap the economic benefits of tourism. Since state residents will among the principal beneficiaries of the frontier, it makes sense for them to also contribute any needed state lands to its creation. This course is also economically feasible. It is true that the state trust lands have historically been earmarked to support the school system. This is an archaic, barter-era feature, however, and is no way to finance a critical function like education. (It is also remarkably unimportant from a practical standpoint: the Salt Lake Tribune reports that the school trust lands are projecting net revenues of only $38.7 million in fiscal year 2002, which is a tiny fraction of the state school budget.) It makes much more sense to put the lands to their best use (the frontier area); to let the economy expand along with visitation to the area; to tax the incomes and businesses that grow with the economy; and to finance the school system through those taxes. Indeed, if the frontier area is in fact the highest and best use of the trust lands, then the trustees would be remiss in their duties if they did not support that use. QUESTION: We residents of the rural West are going to eventually prevail in this debate, so why should we enter into this sort of compromise now? ANSWER: Even if you could be certain of winning the debate (and no one can be truly certain of these things), you run a real risk of winning the battle and losing the war. Winning the battle will mean that you have prevented the wilderness community from realizing its vision of an extensive system of pure wilderness areas. You will not, however, have put into place any alternative vision, except for a general philosophy of multiple use, which has real value but is not specific enough to guide particular decisions. As a result, any initial victory is likely to be followed by a period of philosophical drift, during which you will be eaten up by the most determined parties on the scene, who will be the developers, aided by people that you had thought of as friends and neighbors, some of whom will sell out to the developers. (We don’t have anything against developers per se, and recognize that they are the people who will ultimately have to carry out the actual construction projects, but do believe that they have to operate within the framework of an overall vision if their work is to be beneficial to the public interest.) The probable result is that your existing, very pleasant way of life will be swept away before you even begin to think about organizing a defense for it. Therefore, even if you are not supporters of the wilderness movement, it makes sense to work with the conservation community in a composite plan like Bright Angel — not a compromise, but a composite — that can preserve the other qualities that you value. QUESTION: We members of the wilderness community are going to eventually prevail in this debate, so why should we enter into this sort of compromise now? ANSWER: Even if you could be certain of winning the debate (and no one can be truly certain of these things), you too run a real risk of winning the battle and losing the war. If you prevail in Congress over the bitter opposition of the state and local governments, you will have gained effective control only over the management of federal lands. The local governments most certainly will not go out of their way to help you in the management of the public roads and private landholdings that are within their jurisdiction. And without the cooperation of state authorities in these matters, there are real limits on the scope and merit of what you can accomplish. The federal lands, while large in total area, are broken up by roads and private inholdings at intervals that are seldom more than fifteen miles. If you want to plan and manage for larger-scale results than that, you will need the cooperation of local officials on matters of zoning, road closures, and the like. This need will become more acute with each passing year, as private lands come under pressure for uncoordinated development; in this respect time is not necessarily your ally. Therefore, it makes sense for you to enter into a composite plan like Bright Angel — not a compromise, but a composite — if that results in the local governments supporting land management with a large-scale vision.